“Back-to-back, back-to-back,” the Park Hill football team chanted as the circled up at midfield of Raymond James Field Friday night at the Independence All-School Stadium. The Trojans, ranked No. 5 in Class won, won their eighth-straight game, topping Truman 38-16 to win their second consecutive Suburban Middle Six title. For the better part of the second quarter, however, No. 9 Truman (7-2) had the defending conference champions on the ropes. Park Hill struck quickly, scoring on a 55-yard touchdown pass from sophomore quarterback Billy Maples to senior wide receiver Kentrez Bell on the game’s opening drive. After trading punts, Truman senior quarterback Dean Clemons came out of the game following the first play of the Patriots’ second drive with a dislocated left elbow, forcing Truman head coach Gregg Webb to scramble a little bit. “We actually had a play called the very next play that I thought was going to be a decent play, and then he goes out,” Webb said. “On the con side, we couldn’t throw it anymore, so they could just throw them all in there. On the plus side, Jordan (Salima) got it every time. He got it 37 times, we should have gave it to him 50. I’m a little disappointed we only ran it 37 times now. 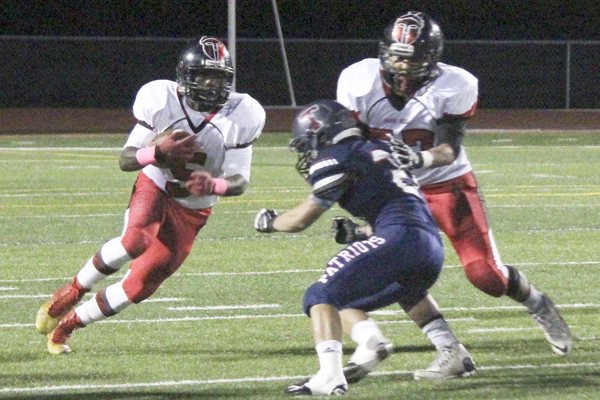 The Patriots went into the wildcat, and led by tailback Jordan Salima, marched down to the Trojans’ 1-yard line. Webb inserted senior Jonathan Gosserand, who left later in the game with an injury as well, under center, but the very next snap was fumbled and the Trojans turned a would-be Truman touchdown into a 14-point swing. On the first play of the second quarter, Park Hill senior running back Zach Neal broke free up the middle and outran the Patriots’ defense 90 yards to the end zone. “Instead of 8-7, it’s 14 because they break one and now we’re just climbing uphill the whole time,” Webb said. From there, though, Salima and the Patriots stole the momentum. The senior standout capped an 85-yard drive with a 29-yard touchdown run and added the two-point conversion. Then, after forcing a three-and-out, Salima scored his second touchdown — this one from 5 yards out — and sophomore Juan Flores gave the Patriots a 16-14 lead with a two-point run. Even when the Trojans knew what was coming — heavy doses of Salima, who finished with 263 yards on 37 carries — Hood’s defense had a hard time corralling him. The Trojans adjusted in the second half, scoring 24 unanswered points while limiting the Patriots to just three first downs. On their first possession of the second half, junior Parker Sampson booted a 32-yard field goal. Then Maples, who was 11-of-15 for 167 yards, threw touchdown passes on back-to-back drives. First, he connected with sophomore DJ Johnson on a 14-yard fade route before hitting Bell, who caught five passes for 80 yards, on a 21-yard post route. Sophomore running back Dorian Clayton capped the scoring with a 7-yard run with 1:19 remaining to reach the final 38-16 margin.